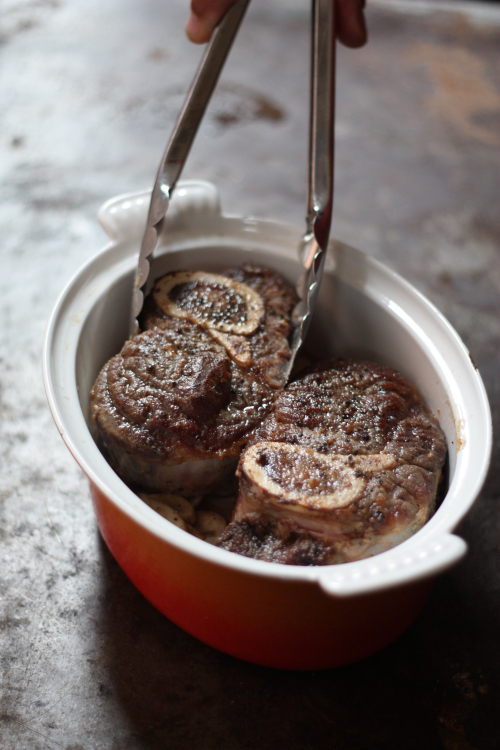 Before the craze of Ossobuco you could buy veal shanks for basically nothing. It was an inexpensive cut that most home cooks were not even attempting because availability and demand just were not there. 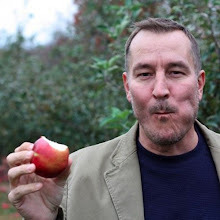 Then there was a turning point. 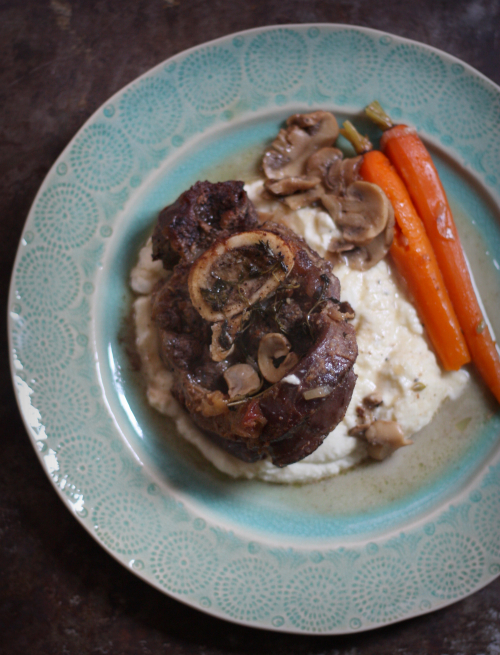 Veal shanks hit the menus of many Italian restaurants, introducing the public to a cut that the butcher was secretly hiding for his family. Veal shanks are certainly more readily available and can run in the 16 to 24 dollar a pound price range. 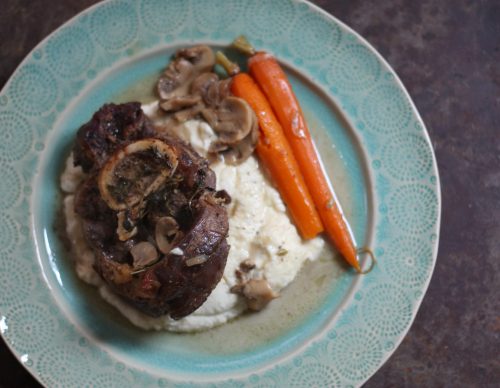 Luckily, beef shanks are still in that affordable range and when cooked similar to veal shanks, can be oh so flavorful. These grass fed local beef shanks I used came in at around 7 dollars a pound and made for an amazingly affordable weekday meal. Let's get cooking! 1/4 cup dry vermouth, feel free to enjoy a martini while cooking this recipe. Begin by melting the butter in a saucepan large enough for the beef shanks. Salt and pepper the shanks well and add them to the melted butter. 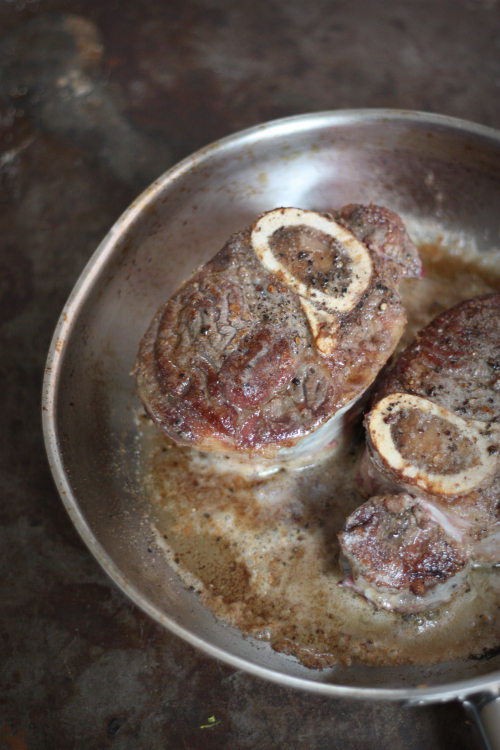 Begin with a good sear on all sides, about 5-6 minutes per side. Remove from the pan and reserve on a plate. Heat oven to 350°. Add the shallot and mushrooms to the pan. Stir until slightly fragrant and any of the liquid is absorbed — add the vermouth and turn to high, allowing to reduce in half. Add the beef broth and bring to a simmer. Place carrots into the bottom of an oven-safe casserole dish. 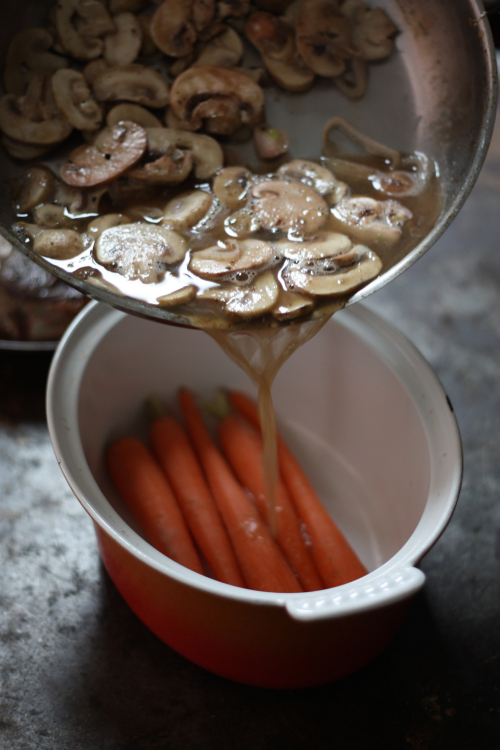 Pour the mushroom broth mixture over the carrots. Carefully place the beef shanks into the casserole dish. 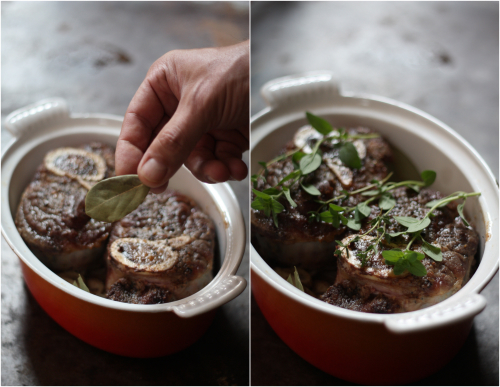 Add the bay leaf to the broth and cover the beef with fresh herbs. 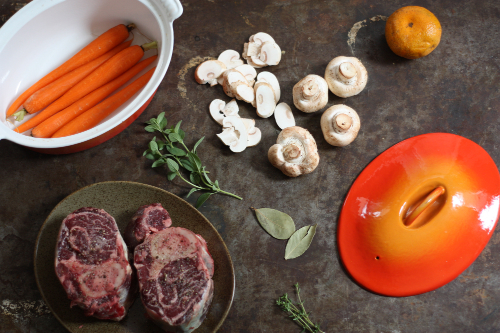 Place the orange peel onto the beef and cover the dish. Place in the center of the oven and cook for 1 hour. While the beef is cooking simply steam your cauliflower. Once done, place in a bowl and add butter, cream, salt and pepper. Mash with a potato masher until incorporated into a rough purée. Once the beef is ready, remove orange peels and plate directly on the cauliflower mash. 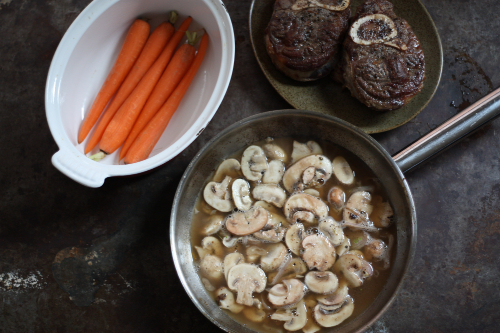 Spoon mushroom gravy over the beef and serve with the side of carrots. The slow braising of the beef will tenderize this cut and allow for a beautiful presentation at the table. 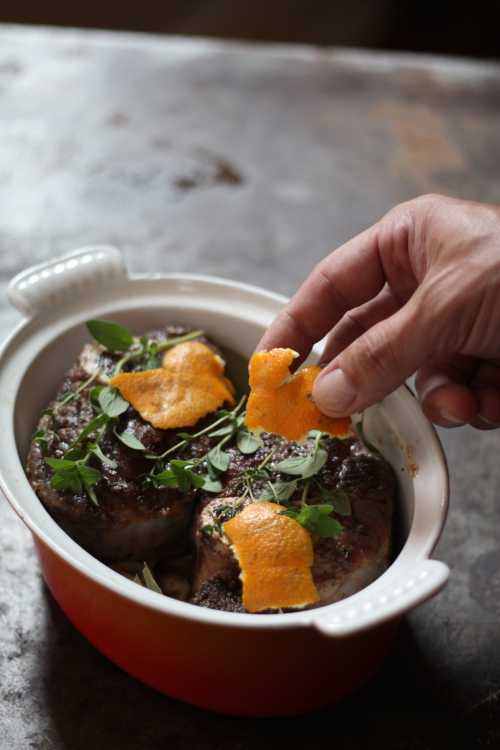 Do not forget to serve with small spoons so the marrow from the bones can also be scooped and enjoyed!